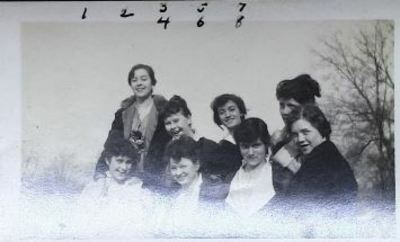 Eight women pose on campus, smiling beautifully. Their names are written on the back: 1. Frances Craven; 2. Margaret Pipkin; 3. Hermose Brown; 4. Martha Ming; 5. Louise Wells; 6. Helen Wallace; 7. Helen Moore; 8. Madeline Aikins.